Lofoten is an archipelago in the county of Nordland, Norway. 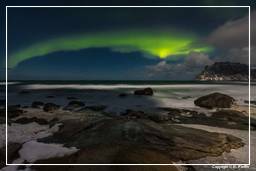 Lofoten is known for a distinctive scenery with dramatic mountains and peaks, open sea and sheltered bays, beaches and untouched lands. The principal towns in Lofoten are Leknes in Vestvågøy and Svolvær in Vågan The main islands are joined to each other and the mainland by road bridges. There is evidence of human settlement extending back at least 11,000 years in Lofoten. 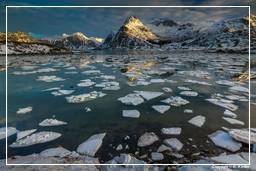 The islands have for more than 1,000 years been the centre of great cod fisheries, especially in winter, when the cod migrates south from the Barents Sea and gathers in Lofoten to spawn. 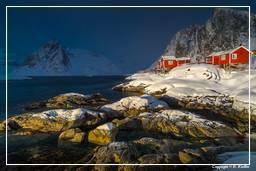 Lofoten is located at the 68th and 69th parallels north of the Arctic Circle in North Norway. It is known for its natural environment within Norway. Lofoten encompasses the municipalities of Vågan, Vestvågøy, Flakstad, Moskenes, Værøy, and Røst. The principal islands, running from north to south are the Southern tip of Hinnøya, the Southern of Austvågøy, Gimsøya, Vestvågøy, Flakstadøya, Moskenesøya. Further to the south are the small and isolated islands of Værøy and Røst. The total land area amounts to 1,227 km². Lofoten features a subpolar oceanic climate. 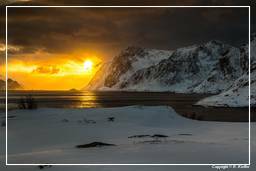 Winter temperatures in Lofoten are very mild considering its location north of the Arctic Circle – Lofoten has the largest positive temperature anomaly in the world relative to latitude. This is a result of the Gulf Stream and its extensions: the North Atlantic Current and the Norwegian Current. Røst and Værøy are the most northerly locations in the world where average temperatures are above freezing all year.